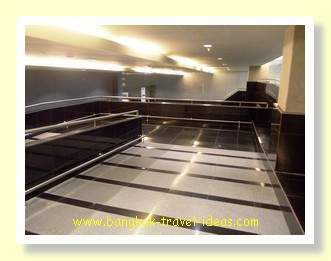 Use the underground Bangkok Airport Hotel walkway to walk from the Novotel Suvarnabhumi Airport Hotel to Suvarnabhumi Airport. 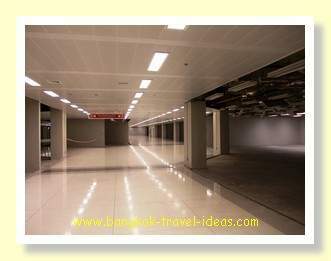 One way to get from the Novotel Bangkok Airport Hotel to Suvarnabhumi Airport, is to walk via the underground interconnecting tunnel. This is the way I went and unless you have a lot of luggage or it does not have wheels, then this is quite an easy walk and will only take a few minutes. 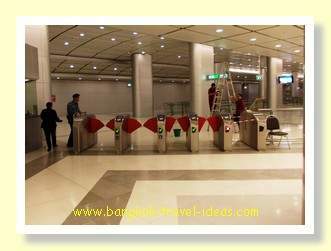 The entrance to the tunnel is at the opposite end to the main hotel entrance, so first you go through a door and down the escalator and then there are three ramps, so that by now you are deep underground. The tunnel is all fitted out to house shops and be a small shopping mall, but currently (Nov 2017) the shops are still mostly vacant and the place was very quiet. In September 2018 some airline offices had taken up some of the space but only a few of the shops were still vacant. 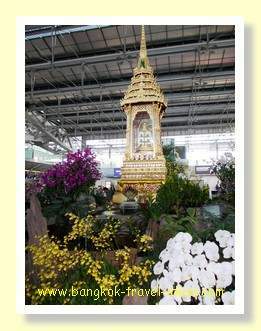 The walk is about 500 metres and leads you past the entrance to where you can catch either the Phaya Thai Express train or the Makkasan Express train that go into the city. 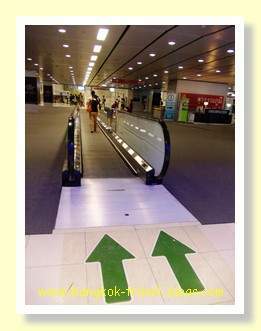 Continue walking with the train station on the left, follow the big green arrows and stand on the moving escalator that takes you up a small ramp. There are few more shops, currency exchange booths and eating places in this location. If you want the best currency exchange rates in the airport then the Super Rich Thailand booth is the place to come and exchange your foreign currency. 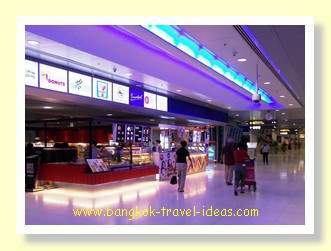 The day I walked past the rates were 10% better than the booths a little further on inside Suvarnabhumi Airport. If you now bear to the right go to the end you will see an up escalator. 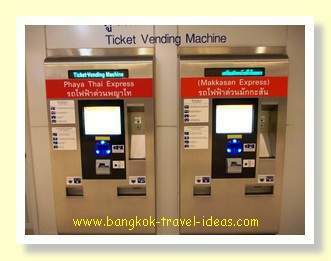 This is the one that brings you out at Gate Number 8, which is where the buses to Hua Hin, Pattaya and Koh Chang depart. 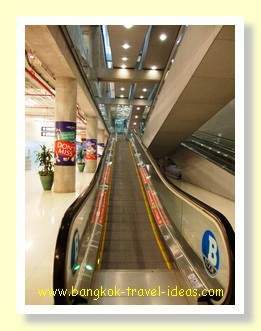 If you want the bus to Pattaya or need to go eat at the Magic Food Point then take the escalator. Otherwise you should take the lift. 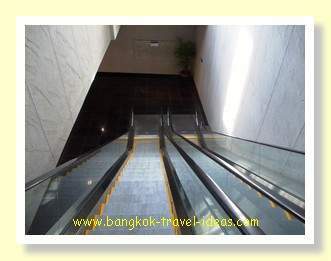 If you ever fall on hard times and can no longer afford to stay in the Novotel Suvarnabhumi Airport Hotel then these are the escalators that you can sleep under. 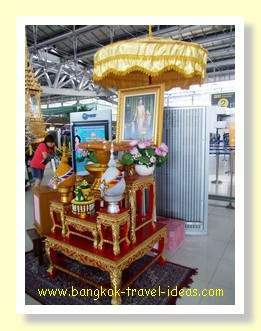 Read more about sleeping in Bangkok Airport. 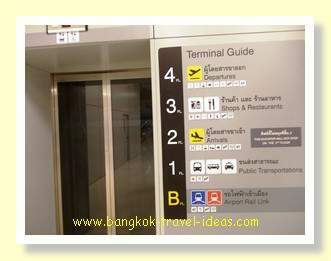 If you are booked on a departing flight then you should take the lift to the 4th floor which is where the airline check-in desks are located. I walked through the tunnel, up the lift to the 4th floor and then wandered past the various Buddhist temple monuments and over to the Thai Airways booking in counter to get my flight ticket and drop my suitcase. For me, my travels in Thailand were complete. 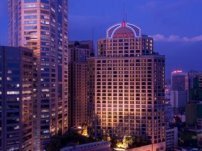 I hope you found this information useful to assist in finding your way around the Novotel Bangkok Airport Hotel and over to the departure terminal. 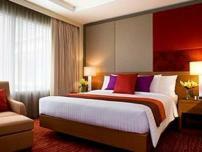 Follow this link to get booking details about the Novotel Bangkok Suvarnabhumi Airport from Agoda. 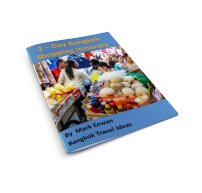 If you do have a lot of luggage you can take the shuttle bus from out the front of the Novotel Suvarnabhumi Hotel. 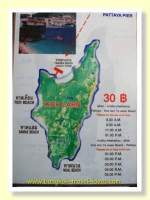 It leaves every hour and it would be best to check with the concierge as to whether booking is required.